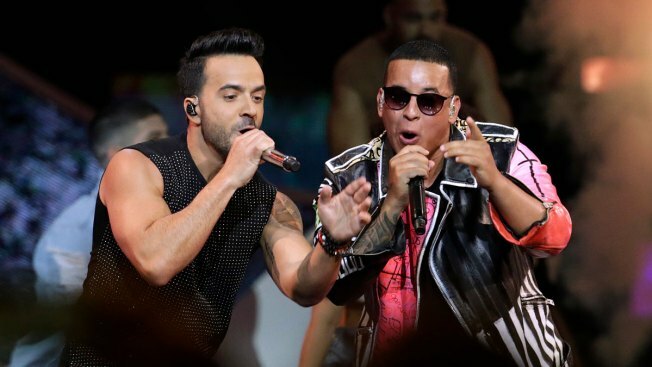 In this April 27, 2017, file photo, singers Luis Fonsi, left, and Daddy Yankee perform during the Latin Billboard Awards in Coral Gables, Florida. The music video for "Despacito," along with other videos, was affected by a security breach on Vevo. "Despacito" and other popular music videos were the target of a security breach on the video sharing service Vevo. The cover image of the Luis Fonsi/Daddy Yankee hit was replaced by an image of masked people pointing guns. Clips by Taylor Swift, Drake, Selena Gomez and Shakira also were affected. A YouTube spokesperson says the company worked with its partner to disable access after seeing "unusual upload activity" on some Vevo channels. Vevo says the breach was contained and it is working to reinstate all videos that were affected and restoring its service. Vevo says it is investigating the source of the breach.